We got it all. From Full Moon Paddles, Manatee Photo Safaris, to Sunset Bike Rides and Food Truck Block Parties. If you're looking for something to do and to meet new people, you've found the place! Wish to save some time at check-in? Complete your Rental Agreement & Release and release in advance and bring a copy with you. Rental Agreement & Release is available at check-in. 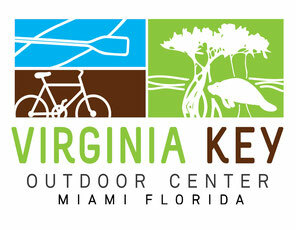 Meet at Virginia Key Outdoor Center, 3801 Rickenbacker Causeway, Miami, FL 33149. Please arrive at least 30-minutes prior to your event start time. Late arrivals are non-refundable. In the case that there is severe weather prohibiting us from paddling, full refunds will be available to participants or the option to rebook at no cost. These paddles are suitable for experienced beginners. Conditions will determine length and final route. Not recommended for first time paddleboarding or kayaking. We will paddle at a leisurely pace. ALL Rentals include your selected equipment, paddle, safety equipment, life jacket, light and guide. Bring any comfort items you may need, a towel, bug spray (just in case, it is Florida), maybe a change of clothes. If you left it behind we probably have it available in our shop. VKOC has private bathrooms (that are stocked), outdoor showers, and a snack and soundries shop on premises. You are welcome to hang out after the paddle and share our grill, have a drink, etc. Good music is always welcome.